Kenyan tourism minister: 'Government is in control' Jump to media player Kenyan tourism minister Najib Balala has said that the government is in control of the security situation in the country after a woman was kidnapped from a beach resort. Hunt for kidnap woman continues Jump to media player A friend of the British man shot dead in Kenya told Radio 5 live that she would not be surprised if he was killed protecting his wife. Kenyan tourism minister Najib Balala has said that the government is in control of the security situation in the country after a woman was kidnapped from a beach resort. 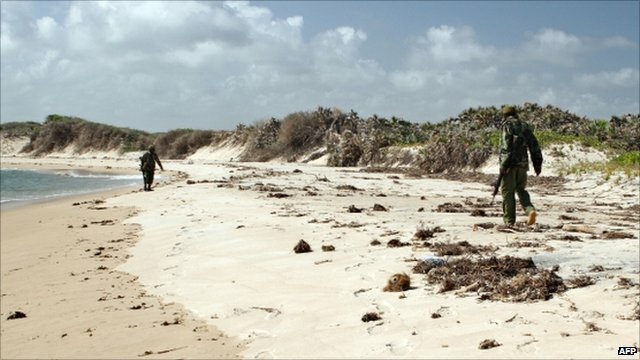 A French woman was kidnapped by an armed gang on Kenya's northern resort island of Manda and taken to Somalia, Kenyan officials say. The kidnap comes three weeks after a UK couple were attacked further north. Mr Balala told the BBC's Will Ross that "the core problem is Somalia and the core problem is criminal elements who manage to sneak into the country".